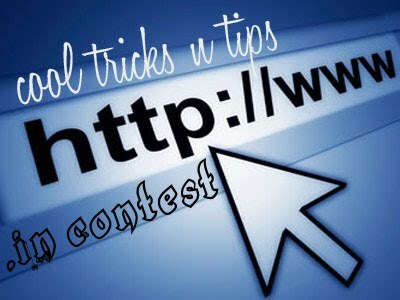 Today is Ganesh Chaturthi and on this auspicious day I am launching Cool Tricks N Tips's first contest. Isn't it great to get some amazing gift during festivals. I am giving away a .IN domain to a lucky person and you can be that person! So without wasting much time, I will come to the point. This will be a Tweet to win contest. All you have to do is tweet and you can win a Free .IN Domain. As I am offering just 1 domain name, I am going to keep the contest duration short. 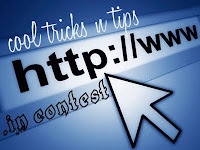 The Cool Tricks n Tips Contest starts when this post is published and will end on 12 September at 12am IST ie on 13th. Check the count down clock below to see how much time you have got to win the .IN domain. Now that you know about the Prize and the contest duration, I will tell you the rules of this contest. To send the second tweet, check the posts on Cool Tricks n Tips and tweet the post that you like. Once you have sent both the tweets, copy the URL of the tweets and add a comment here containing both the links. If you don't know how to find the link of the tweet, check any of your tweets and you will see that the tweet has time and date on it. Click it and you will get the url of the tweet. That's it, post both the tweets and add both the links in the comments section, so that we can check the tweets. Once you have added your comment, you will qualify for the contest. The winners will be chosen by using random.org . What are you waiting for!!! Go Tweet and WIN a .IN domain.